In 2009, the Holland America Oosterdam went through a refurbishment allowing for her 34 new staterooms and added verandahs, the Pinnacle Bar, the library-internet café-coffee bar establishment and an Italian eatery, Canaletto, to be added making her more roomy and luxurious than ever before. Holland America cruise ships are known for passenger comfort and space, in fact, they can boast some of the largest staterooms at sea and with a great crew to guest ratio, the traveler’s every whim can be taken care of. Holland America Oosterdam has a two decked main dining room, The Vista where guests can choose reserved seating or just drop in for dinner, and places like the Pinnacle Grill, the Lido for a buffet style experience or an Asian sushi bar for those who want a little taste of the Orient. There is 24 hour a day room service and pizza stations as well as a do it yourself taco bar meaning plenty of choice in varied surroundings. With her enrichment activities, including the Culinary Arts Center and the Digital Workshop, guests can learn something new on each cruise. Language classes, trivia nights, movies and art auctions as well as casino tournaments add to the excitement as does the 3 decked Vista lounge where shows are staged on each sailing. Jazz bands, classical quartets and the Northern Lights Disco complement the lounges and bars for a quiet drink and of course there are always the pools and Greenhouse Spa to indulge in. Holland America Oosterdam sails to Alaska as well as numerous Australian ports and New Zealand places of interest on her varied itineraries. Since the summer is the best time to cruise to Alaska, she shares the year between hemispheres, allowing for Alaska cruise deals in the summer for us and Australian cruise deals during our winter for those ‘down under’ to enjoy. 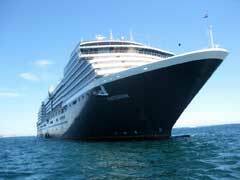 The Oosterdam is a ship that offers cruisers that special attention and eye on detail that may not be possible on larger vessels. With an extensive art collection, striking colour scheme and plenty of room for each passenger to get some quiet time, if that’s what you are looking for, Holland America Oosterdam really delivers on the wow factor. Those looking for something to do will find the enrichment classes a nice change of pace, whether you choose flower arranging, indulge in a wine tasting or learn how to digital scrapbook in the workshop.